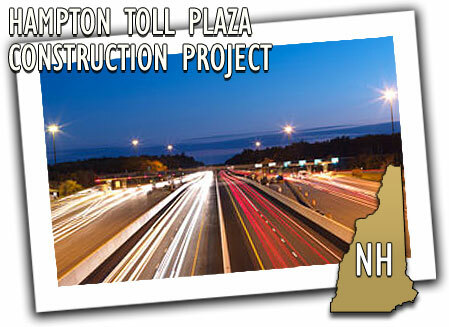 New Hampshire DOT made the excruciating delays at its Hampton toll plaza a thing of the past when it completed its Hampton Open Road Tolling project in 2010. The Hampton toll plaza, located on Interstate 95 near the I-95/New Hampshire-101 Exit 2 interchange, is the busiest toll plaza in the state's turnpike system during the summer months. Even with its 16 lanes, the plaza did not have the capacity to handle the seasonal traffic demands, which resulted in frequent and exceptionally long traffic delays. NHDOT partnered with HNTB and began the $17 million dollar conversion to open-road tolling in 2009 after coming up with a plan for the project. NHDOT had an aggressive timetable, placing the project on a fast-tracked 16 month schedule through a collaborative effort between NHDOT and HNTB. Both organizations pointed to the combination of HNTB's experience and NHDOT's exceptional organizational and management skills for the project's success, creating an ideal working environment for efficiency. The project met that ambitious 16 month schedule and, in May of 2010, was ready for use by the public, who were thrilled to see their usual delays no longer existed. The conversion to open road tolling allowed the New Hampshire DOT to cost effectively increase traffic capacity and safety at the toll plaza. The project was so successful, in fact, that the New Hampshire DOT enjoyed reading an apology from one Boston Globe writer who -- amazed with the ease with which he drove through the toll plaza -- wrote, "I'm sorry that anyone from my paper, my city, my entire state has ever uttered a negative word about your wise and noble people."